AAEA Hollywood: Prince Giving Away 'Planet Earth"
The Artist Now Known As Prince is giving away his new album, Planet Earth and it is making his record company and others very mad. He isn't giving it away in the USA mind you, just in the UK via a tabloid newspaper -- Mail on Sunday. Sony BMG UK is livid and threatening to pull the plug on its own release. The LP (oops) CD will drop in the USA on July 24. Is Prince doing this for publicity? He evidently likes to mess with the record companies. Is this little rebellion in the UK his way of sending a message (remember when he had SLAVE written on his face). Somebody over there must have pissed him off and this is his way of retaliating. Prince obviously likes to stick to more than just the music. Hopefully this will be some type of environment record along the lines of Marvin Gaye's Mercy, Mercy Me tune. 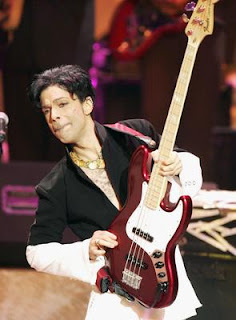 Hey Prince, if you see this please give AAEA a shout out. Rock on.